Hey folks, were back with Dr. John Beradi, who shared with us in Breaking Old Habits some techniques used at Precision Nutrition to help people make positive lifestyle changes when they are first starting out. He continues today with part two to my three phase question, giving good solid advice that holds you accountable to your fat loss program. So let hear what the doctor has to say. John Berardi: Part of our Lean Eating coaching involves a big $10,000 prize to the top male transformation and a big $10,000 prize to the top female transformation, with other cash prizes for the runners up and stuff like that. Now that’s a very extrinsic motivator, right? It’s money from the outside world for having a great transformation. And we find consistently that these kinds of extrinsic things work, but they only work for about a nanosecond at the beginning. It’s that initial thing that helps someone overcome inertia. We’ve seen programs like this like the Body for Life stuff. Bill Phillips was one of the early champions of these sorts of prizes. And whether you like them or whether you don’t, you have to appreciate the fact that big prizes. Big extrinsic motivators at the very beginning are really, really powerful to inspire action. Now here comes sort of the paradox of it. After that initial phase, those sort of extrinsic motivators are almost meaningless. So there has to be some other source that keeps people going after they’ve overcome the inertia. And I know this becomes a little complex and a bit nuanced and almost paradoxical because people want a simple answer. What gets people motivated? Well, there’s a temporal thing. At the beginning, it’s usually extrinsic prizes. However, as they go through the process these extrinsic prizes become less and less of a powerful motivator. And you just think about the psychology here, and it makes complete sense. So let’s say I sign up for a body transformation program like Lean Eating, and I want to win the ten grand. I know from the very beginning that my exercise and my nutrition need work. So I’m going to go commit to this and the ten grand is going to help me make that change. Then about a month into this new program where I am going to the gym four or five days a week or doing body weight workouts at home, whatever it might be and also changing my nutrition habits. Then all of a sudden it gets uncomfortable and a hassle. So that’s when we start to justify things. Like saying, “I know I said I was going to try and win this $10,000 prize, but it’s probably not that big of a deal. I don’t really need the money anyway, so I can skip the gym today.” We start to justify away the positive rewards, because it becomes a hassle to workout. It just feels crappy at times. So what we need to do at that point is to have some source of punishment for backing out. In Lean Eating we talk about this quite a lot. In the beginning there’s a big powerful extrinsic motivator. Then during that hassle phase, once you actually start doing this stuff and realize there’s work involved. You need something that punishes you to prevent you from backing out because you’ll find that the prize isn’t enough. The prospect of some future earning based on doing a whole bunch of hassle today isn’t enough to keep you going. And there’s this great book called The Blackmail Diet. It’s been out of print for a while so it’s really hard to find, but this psychologist from Michigan State University talks about this idea of blackmail being essential at a certain point of a weight loss journey. His whole thing is that when the motivation, that initial extrinsic motivation, dies off which it always, always does and YOU NEED SOMETHING TO KEEP YOU TRUE TO YOUR PATH. So his thing, and at times it was a little bit, tongue and cheek, was to have some punishment that you don’t want to experience. So you’re afraid of the punishment so you keep going. Now for him – this is kind of a crazy one – he basically took ten grand, and he put it in an escrow account with a lawyer. And he told the lawyer, “If I don’t come back 70 pounds lighter in a year,” then donate that money to an organization that he would not support or otherwise give my money too. So that was his punishment, and oddly enough, a year-and-a-half later he came back, and he had LOST the 70 pounds. So then he took it a step further, and said “Okay, well weight loss is actually easy. Keeping it off is hard. So if I don’t come back in another year having kept those 70 pounds off that money go to another charity I wouldn’t be in favor of.” So he created a new anti-cause, if you will, for his money to go to. So that was his idea. We need something to hold us accountable even when the motivation wanes that initial thing. We talk about this all the time in fitness, “How do you motivate your clients?” I think you can only motivate your clients during the very beginning just to get them acting, get them to change something. Then you get to this phase where the hassle is greater than the joy of doing it, that’s when you need some sort of punishment. So you ask what the first step is. Well, the first step really it’s some extrinsic motivator, something critical upfront to overcome the inertia. However, again, motivation isn’t an IMPORTANT thing in long-term fitness. People really think the motivation is critical and that those people who really succeed and get in great shape and maintain it for life are motivated all the time. And it’s simply not true. Even the people who are sort of like the pinnacles of health and fitness aren’t always motivated. I had a great secondary lesson of this during one of our last Lean Eating contests. Our female winner, the girl who won ten grand for this last six month transformation journey, she had lost over 20% body fat, and again, won ten grand in this process. She was putting down journal entries where she was having these days where she was really unmotivated. And she was thinking of quitting. So here’s a girl who has the best transformation out of like a thousand people over the last six months, won ten grand – she was going to go on to win ten grand just a month later. And she was thinking of dropping out because she felt like she wasn’t motivated enough to do this. You see that is just a misunderstanding on her part. Motivation isn’t what’s required. Showing up is all that’s required. So anyway, I hope that answers your question, Craig. It’s not a simple answer, but I really think there are phases of involvement and psychological phases during our journeys. And we need to appreciate them, and we need to introduce the right things at the right time. CRAIG BALLANTYNE: That’s very good. And I had this written out, and I’m not sure if you’ve covered all of this. So if you have just let me know. 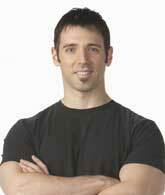 Tomorrow in part 3 with Dr. John Berardi we’ll find out what causes people to give up on their workouts.